Even though it was an unseasonable 70 degrees last Friday, I knew I was making a batch of soup for my friends no matter what that weekend. I had been thinking a lot about this recipe for Chicken and Chive Dumpling Soup that came to my inbox earlier in the week. Sometimes soup recipes can be intimidating because of the long ingredient lists and cooking times. I was astounded by how simple the dumpling-making instructions for this recipe seemed and the 40 minute cooking and prep time. It turns out that it really was that easy and fast! The soup came out creamy and delicious and the dumplings were light and fluffy. I think I would go for a larger pot next time though, because after step 3 I somehow ended up with one gigantic dumpling instead of little ones. After laughing at the mistake for a bit, I simply broke up the dumpling mound with a wooden spoon and it was fine. Next time I would add more chicken broth to make it more soupy and less like a chicken pot pie (not that there's anything wrong with chicken pot pies!). Even after serving 4 people this recipe still provided enough for leftovers. Got a good soup recipe? Please share! I am super excited to have my first treats from the Treats Truck today! Their mobile bakery named Sugar is full of yummy baked goods. I didn't eat my treats all at once, but I could have! So far I have devoured the chocolate chip cookie and it really hit the sweet spot! 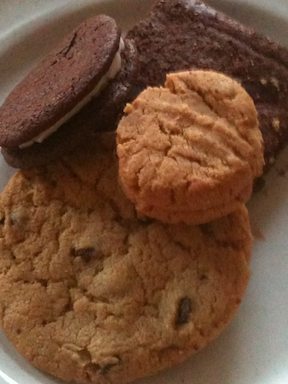 Check the website for Treats Truck locations or follow it on Twitter @TheTreatsTruck. Thanks to my bf for picking them up! Hungry Bee New York on Twitter! For more food fun and news you can now follow Hungry Bee on Twitter @hungrybeeny! 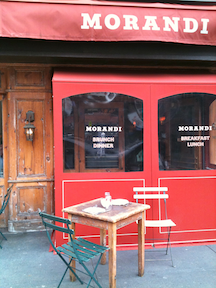 Last weekend I tried a new brunch spot in the West Village, Morandi. 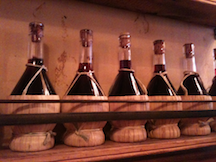 The dining area of Morandi had a rustic, homey feel and was fairly large. It was a good thing I made a reservation though because the restaurant was packed, and space was definitely at a premium! 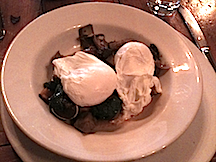 I ordered uova in camicia (poached eggs) over artichokes, squash, and mushrooms. The eggs were cooked perfectly, but the dish definitely could have used more seasoning, or any seasoning really. After sampling my companions' meals, I found that the garganelli alla bolognese (egg pasta with meat sauce) was delicious, and the focaccia “occhio di bue” was also tasty. 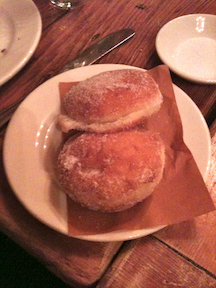 The surprising highlight of the meal however were the donuts that we got as an appetizer. They were light and fluffy with just the right amount of sugar. We even got a batch to go! I would definitely dine again at Morandi, perhaps in the evening, so I can try more of the pasta! If you want pizza at home instead, that can be easy too. Whole Foods has a selection of pre-made pizza dough, and this week my friends and I used the multi-grain variety to whip up some homemade pies. The batch of dough we got was a bit difficult to roll, but it flattened out after a little elbow grease and flour. From what I read since then, it also helps to bring the dough to room temperature and let it rise for a while before rolling. 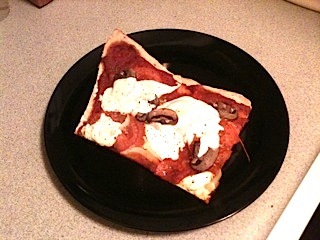 This was the first time I used a pizza stone which was cool, but a baking sheet works just fine as well. Once the dough was ready, we put it in the oven for about 8 minutes at 350 before added the toppings, and then carefully filled the dough with sauce, mushrooms, onions, tomatoes, and fresh mozzarella. It took our pizza at least 30 minutes to bake, until the cheese was melted and the crust was golden brown, but you can speed up the process by upping the temp if the recipe allows. As you can tell from the pictures, our styling needs some work—it’s more modern than traditional-- but it tasted great and we were proud of our work! Check out easy these recipes from The Foodinista and Blue Kitchen for more inspiration. HB Eats: St. Patty's Day Sweets! 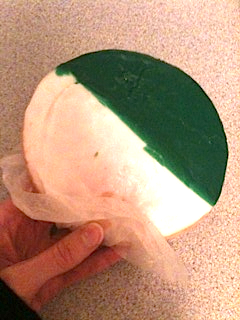 You know St. Patrick's Day is near when they have green and white cookies at Hot & Crusty in Penn Station! Another fun treat that some of friends are semi-obsessed with is the Shamrock Shake from McDonald's. The tricky part is that they don't have this sought-after shake at every store. Here is an entire website dedicated to finding the minty shake closest to you, or you can make your own. Anyone know of any other St. Patty's Day sweets I should try? Loving these birthday cupcakes from Billy's Bakery in Chelsea. My favorite is the classic chocolate cupcake with vanilla buttercream frosting. Yum! 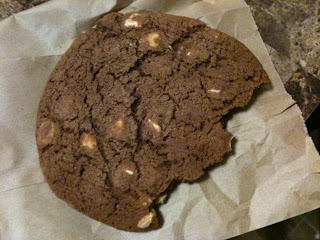 I couldn't resist this giant white chocolate chip cookie at Orchard Farmer's Market in Sunnyside. My first bite as I walked out of the store was a little hard, but when I got home I heated it up in the microwave and it was warm and delicious! The market also has a variety of other fine looking baked goods. Sometimes the best meals are the unexpected ones. 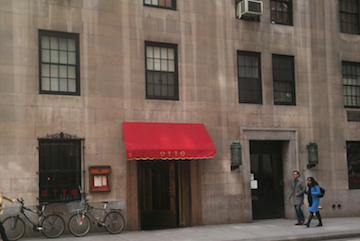 I was strolling around in midtown this evening and noticed a Chinese and Vietnamese restaurant, V33. Usually I am wary of such combo-cuisine establishments, but I have been craving Vietnamese for weeks now, so I decided to give it a try. The decor was plain and the temperature a little cold for dining in, but the food was wonderful. I had my two favorites, shrimp summer rolls and beef bun. The rolls were jumbo in size which was fun, and the beef and vermicelli were cooked perfectly. Overall it was a lovely time, and a great find since Vietnamese places are sparse in that area of the city. What's your perfect meal?